Many people's first reaction when they believe that something bad is happening to their machine right now is to pull the power plug right now. On laptops, that might even include holding the power button down for 10 seconds, which is never a good idea. "... the ideal scenario is simply to disconnect your computer from the network." The problem with these methods for shutting down your machine is that they don't give Windows a chance to shut down cleanly. That's very important - it's definitely not something that you want to skip. When power is removed unexpectedly, you're playing a virtual game of Russian roulette. Most of the time, it might result in no noticeable problems at all. Sometimes, you might notice some minor issues after you boot again. In the worst case, it's quite possible that your computer may not boot again. So don't pull the plug or force a power off as anything other than a last resort. As you indicated, the ideal scenario is simply to disconnect your computer from the network. It's quick, it's painless, and it definitely stops the download. "Pulling the plug" can, indeed, mean physically unplugging the network cable from your PC. But as you also alluded to, you could unplug your router or access point. You can unplug its power, instantly turning the device off, or like your PC, you can simply disconnect it from the network. In addition, many laptops have switches of various sorts that will turn off their WiFi adapter effectively disconnecting you from the network. Regardless of how you do it, simply physically disconnecting from your internet connection is the fastest and safest way to interrupt a download that you suspect may be malware related. What if there's no plug within reach? What if the cables are all hidden, the networking equipment is inconveniently located, or you're using a laptop with no WiFi switch? This is one of the reasons why I keep the network icon visible in my taskbar's notification area. 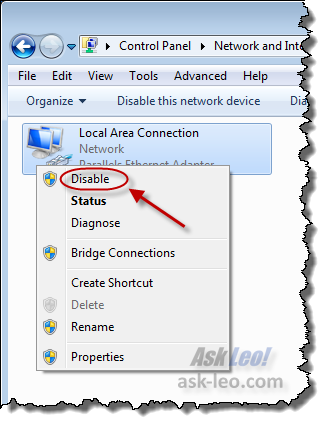 Right-click the network connection icon and then click on Disable. That's it - connection interrupted. In Windows 7, it's a step or two more complex, I'm afraid. Windows 7 doesn't display the same network icon as Windows XP does, so it's worth knowing about these steps. Right-click the network adapter that represents your internet connection, and click Disable. Five clicks and your machine is disconnected from the internet, quickly, safely and without damage. Then, after you've secured your machine and perhaps checked for any malicious fallout, you can return and enable the network connection in the same way. How can I stop a message in my Outlook outbox that won't send? Once a message goes into your outbox, Outlook tries to send it. While it's trying, there's little you can do. So the trick is to force it to stop trying. How do I get rid of unused network icons in my taskbar notification area? The area of you Windows taskbar near the clock can have an icon for every network connection. We'll look at how to get only those you care about. How can my ISP tell that I'm downloading copyrighted files? Some ISPs are taking a more aggressive position to stop illegal file sharing. Your ISP can see a lot, including the fact that you are filesharing. Re: Win 7 and five clicks to disable internet connection. Can a shortcut icon be created on the desktop for a one click solution? Kill switch rigged to MIG welder aimed at hard drive ftw. You can use the command "netsh" to enable/disable a network interface. That will show you all of the network interfaces. Find the one that you use (state will be "connected"), and make note if its "interface name". Note, however, that if UAC is enabled, you need to run the command with elevated privileges in order to enable/disable the interface. Create a shortcut with the above command, and make sure to set the properties to "run as administrator" under "shortcut / advanced". I thought taskbar "Task Manager" and "End Process" would stop a download. Is this not correct? Only if you know what process it is that's doing the download. That's not something I wanted to assume. I use Firefox and sometimes when I get redirected to a nasty site I kill the process. Sometimes I need to do it twice because of the automatic tab restore though. Create a one click shortcut, under Windows 7, to access your connection. As stated in the above instructions and you click the "Change adapter settings" right click your connection and then select "Create Shortcut. The SC will be placed on your Desktop where you can pin it to the taskbar, copy-paste it elsewhere, either way to disable your connection with click the SC then the "disable" button". "Engage Internet lock" or "Stop all Internet Activity"
However, “pulling the plug” solution does no harm to a Linux OS with a journaling file system (Ext3, Ext4, Reiser). Generally ... one cannot stop wondering why anyone would still use the “MS Windows” dinosaur (other than have Bill Gates laugh all the way to the bank). What about pressing the "standby" button on your modem? Will this work? It's also good to use WOT which can warn you about dangerous websites. It will warn you if you click on a dangerous link. They miss very few bad sites but unfortunately flag a few safe sites as bad. That would also work. I don't know if it would be as fast as pulling the network plug, though. I's basically not much different than closing the program by right clicking on the task bar or clicking the X on the browser window. 99.9 of malware coming to the average user is a drive-by variant. These require action on your part!!! DO NOT touch, close browser. If you have the expertise locate and delete bad guy! The rest of us run good spyware program. One that always works for me Malwarebtes' Anti-Malware. Oh, if you run Panda, and quit looking for russian brides.. it will not happen so often. One other suggestion, if you have children(tweens to teens) you might consider OpenDNS. Install some controls and those type of pop-up scare you boogie-men will be eliminated!! How about the "Work offline" command in your browser's File menu - if it has one? IF you know that the download is being performed by the browser, and IF you know that it'll take effect immediately. In an "emergency" I'm not sure I'd trust either IF :-). fortunatly, Avast gives the instant window option of killing the window with a click, keeping the browser and everythingelse open as normal but erasing any part download from the offending site. When I get an alert, effectivly, it immediatly stops everything, ie ' freezes' anything coming from the site till I make a decision in it's alert window. Saved my machine many a time. With some of the latest viruses out there, you might not even know you have one until a "Windows Security Software" or "Drive Repairer" screen appears telling you your system has hard drive errors or viruses. At that point unplugging your data cable is too late. Some of these new viruses prevent you from opening utilities at that point. Using a small disposable external USB drive, I suggest running ComboFix from the Safe Mode Command Prompt and then Malwarebytes from Safe Mode with Networking repeatedly until Malwarebytes reports 0 viruses. This works effectively on any virus I've encountered so far. So keep your virus updates current, your windows updates current, use high security options in your browser #like disabling 3rd party cookies# and periodically make an image of your entire hard drive to an external NAS device such as an Iomega StorCenter. Worse comes to worse, you may have to restore from your most recent image backup if the virus completely kills your machine. john neeting said: ". . . Avast gives the instant window option of killing the window with a click, keeping the browser and everything else open as normal but erasing any part download from the offending site." Could you please explain where that option can be located or invoked? I'm using Avast (free) but I don't see that option. Keeping the file in the desktop will help. "I went to a "legitimate" web site and saw an instant notification of a virus: bars growing in a strange display - that kind of thing. It did not look like any display that my regular firewall and antivirus ever shows. " Ten to one, this was not actually a virus being installed, it was an attempt to convince you to buy and install a program which would "solve the problem." Not only are you wasting your money, you're installing malware. I have Windows 7 Premium, and Dialup with MSN. I cannot hardly navigate, for these, always coming up, "Webpage has expired", "This program cannot display the webpage", and "Navigation has expired". Are these Malware, viruses or what? Or do I have a PC problem? Sorry about changeing the subject, but I need help bad. Could you send an e-mail, Please. Sounds to me like perhaps your PC's clock and/or timezone are incorrect. Would you believe this? I just got an email from a trusted correspondent with a website link. I pasted it into Chrome and got an instant avalanche of popups purporting to show infections, trojans, bubonic plague etc. I clicked on a red X and a download started instantly. I hit the "standby" button on my modem - just what I asked about yesterday. I got a "download interrupted" message immediately. So it DOES work. I ran malwarebytes scan - no malware found. Leo has never sent me a more timely tip. Thanks. 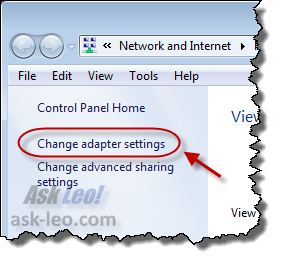 Leo provided info on disabling the network in XP and in Windows 7. Anyone have a quick shortcut for Vista? Thanks. I never click anything on these malware installs. When I see something suspicious start I hit ALT-F4, repeatedly. Clicking anything on the malware items can trigger them to install. A clever one I saw last week had an uninstall shortcut that pointed at the install exe. One of the best recomendation I ever read. 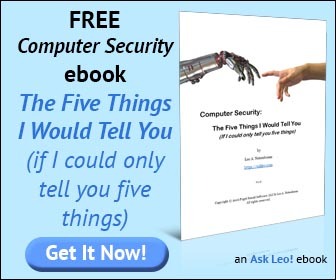 "Leo provided info on disabling the network in XP and in Windows 7. Anyone have a quick shortcut for Vista? Thanks." 1. In Control Panel, click on Network and Sharing Center. 2. At the top, click on the Network icon. 3. In the Network window, right-click on your router or modem icon. 5. Move the shortcut icon to wherever you want it (e.g., pin it to the taskbar). When in panic mode, just click on the icon to disable your Internet connection. 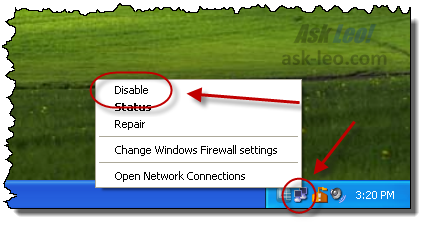 On using "Disable" from the Network Connection icon in the XP taskbar: this is not possible if you're using a Restricted account (i.e. without administrator privileges), which I do myself for most activities and recommend to others because it reduces (probably doesn't eliminate) the risk of malware being installed. I am using Avast 4.7 Professional and this action is automatic [!]. I'm not going near 5 with a barge pole.